In February members of WDBKA gathered to welcome Dr Sara Robb of ‘Bath Potions’, to our programme of monthly winter lectures. Sara started the evening by explaining how her studies as a chemist in America and subsequent move to the UK to continue her research, eventually led to the establishment of her own honey soaps and beeswax creams company. She has become well known to Beekeepers through the promotion of her books, talks and demonstrations at the National Honey Show and the BBKA Spring Convention. 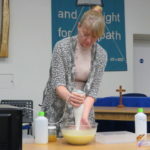 She is well qualified to have developed her popular range of products and explained the chemistry behind the process of soap making in a clear and entertaining manner. The audience were interested to learn how to make use of their own honey and wax to create products. 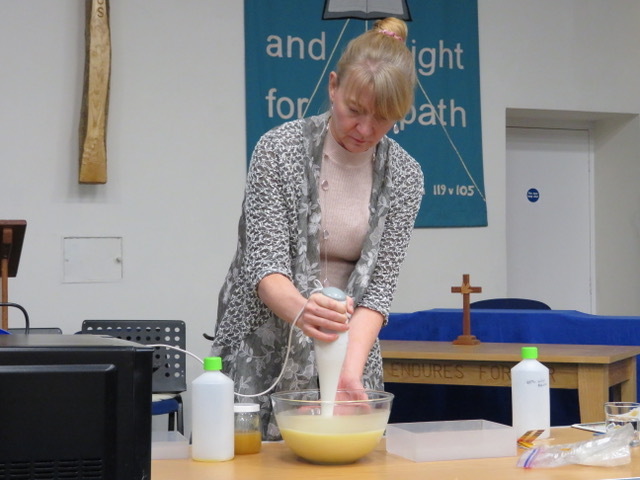 Sara gave a demonstration of soap making which required surprisingly few ingredients. .
Sara also told us how to make cerate ointment and told the audience that she had written an article for the Bees for Development Journal in March 2016 … which is easy to find on line. The curative properties of the mix of beeswax, honey and olive oil have been known for centuries. Sara referred to a record she had found in the 1809 edition of the Royal College of Physicians Pharmacopeia. By the end of the evening many folk were keen to have a go at creating their own soaps … Sara reminded us that in order to sell to the general public each product required a safety assessment in order to comply with EU regulations… although there is nothing to stop us from making gifts for family and friends!